Google today announced two new features in its Slides product: editable master slides and the widescreen format set as default. The former means you can change the theme for your whole presentation and the latter means you can show it off in a view that better fits your TV or monitor. Customizing the presets for your presentation allows you to easily tweak how content appears on every slide by selecting “Edit master” from the Slide menu. In other words, editable master slides let you set your header to a specific font, make all of your first level bullets bold, and add a logo in the bottom right corner on every slide. Furthermore, each theme consists of a variety of slide layouts, which can now also be individually customized or created from scratch. You can follow the instructions on how to do all this here: Edit master slides and layouts. As for widescreen presentations, Google says the new format gives you “a ton of new space to fill with words, charts, tables or even a simple, beautiful image.” Widescreens have fewer pixels than your standard resolution of the same size, but given that the world has largely moved to widescreens, it makes sense not to waste this space. 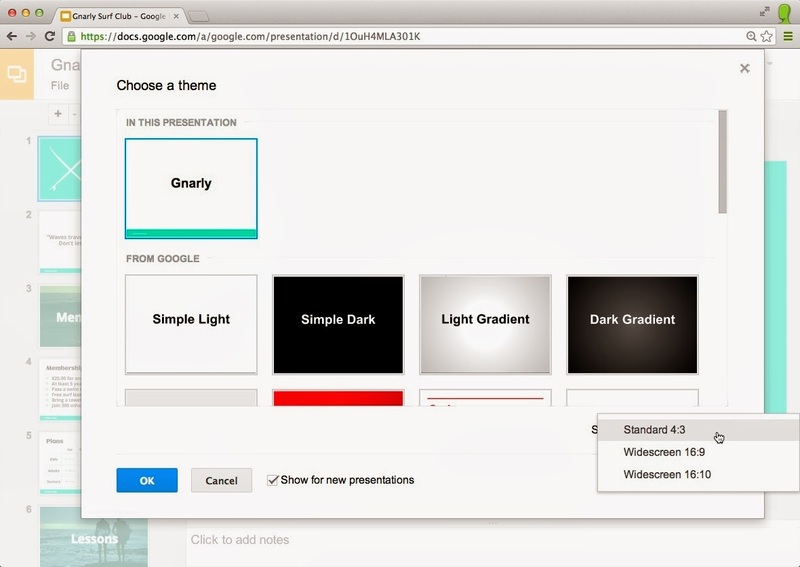 As such, Google explains that this is the reason new presentations will be widescreen by default. Nevertheless, you can still change the size of your slides using the pull down menu in the theme chooser, or by visiting Page setup in the File menu.